The Berlin Victory Column (German: Siegessäule) is a monument located at the very heart of Berlin’s largest inner city park – the Tiergarten. It features an observation deck (or viewing platform) from where you have a nice view on the surrounding park Tiergarten, the boulevard Strasse des 17. Juni and its iconic Brandenburg Gate (Brandenburger Tor). 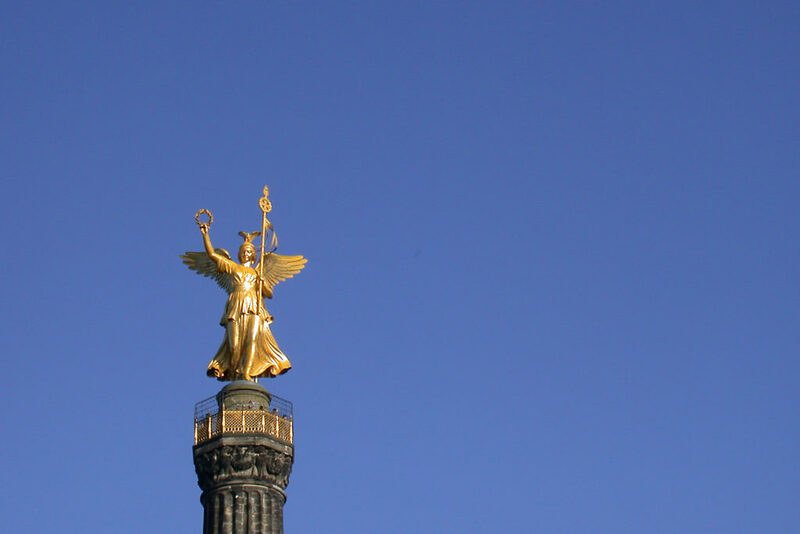 First things first: the ‘angel‘ on top of the Victory Column is actually not an angel – even if ‘everybody’ says or thinks it is an angel. Instead it is meant to be Victoria – the personified goddess of victory in ancient Roman religion. The monument was however originally designed without the Victoria sculpture on top. Designed by Heinrich Strack, the construction of the monument began in 1864 to originally commemorate the Prussian victory in the Danish-Prussian War (1 February – 30 October 1864). By the time the victory column was inaugurated in 1873, Prussia had also defeated Austria and its German allies in the Austro-Prussian War (14 June – 23 August 1866) and France in the Franco-Prussian War (1870–71). These additional victories lead to the decision of adding the “golden” bronze sculpture of the goddess Victoria with her iconic wings on top of the monument. As you might have heard already, Berliners love to name their monuments a bit different. So basically from the inauguration on the golden figure on top of the monument was given the nickname Goldelse, obviously referring to the gold on the one hand, but also to a popular story Goldelse that was published around 1866 in a the magazine Die Gartenlaube – Illustrirtes Familienblatt[ (The Garden Arbor – Illustrated Family Journal). Trivia: the magazine was basically the first successful mass-circulation German newspaper and a forerunner of all modern magazines. Originally the on the Berlin Victory Column was erected on Königsplatz which today is called Platz der Republik – right across from the Reichstag building. In 1939 however the monument was relocated by the Nazis in preparation of the monumental plans to redesign the city of Berlin into what they called Welthauptstadt Germania. SInce then ithe Victory Column is located in the middle of the great street circle / intersection Großer Stern (“Great Star”) in the middle of the park Tiergarten. The relocation of the Victory Column probably also saved the monument from destruction. The original site in front of the Reichstag was badly hit by American air raids in 1945. The location at the intersection Großer Stern was however not hit by any bombs. There is no U-Bahn, nor S-bahn nor Tram nearby – so buses are basically the only means of public transportation that gets your near the Victory Column at Großer Stern. You can choose from the buses 100, 106, 187 and night bus N26 and get off at the bus stop “Großer Stern“. Otherwise it would of course be rather easy to reach the Victory Column both by bike and by car – and there are also lots of parking spaces available – free of charge. And also a long walk across the park Tiergarten could actually be an option – but depending from where you start walking this could actually take some time. No matter how you get to Großer Stern – the last meters you will have to use one of the four pedestrian tunnels. Please do not try to cross the street – it would be really really dangerous since it’s a heavy traffic crossing. And even if you don’t see any car approaching – the next bunch of cars might be just around the ‘corner’. The viewing platform of the Victory Column is basically open all around the year – except for December 24th. The door to the staircase opens at 09:30 in the morning and closes depending on season and weekday between 05:00 pm (winter weekdays) and 06:30 pm (summer weekend. Admission / regular price is 3 Euro – reduced tickets available for 2,50 Euro. Further details can be found on Berlin’s official website here. Please be aware that there is no elevator!